Genomics will transform patient outcomes and healthcare systems – and NHS England is already moving to make a mainstream genomics medicine service a reality. Realising this potential fully, however, demands more. As the CMO notes, we need to make the leap from genomic medicine as a “cottage industry”’ to genomic medicine on an industrial scale. It may sound obvious, but this transformation can only take place with deep industry partnerships in place. Kick-starting a UK genomics industry has been a core Genomics England aim from the outset. It recognises that − while NHS England, Genomics England and others build the data resources, infrastructure and systems − it is industry that develops the medicines, treatments and technologies that have such a big impact on patients’ lives. Clearly, effective industry partnership also has the potential to deliver a boost to the UK’s economic health. The Government’s Industrial Strategy White Paper focuses on the Life Sciences as a growth driver − already bringing £64 billion a year to the UK economy and employing over 220,000 highly skilled scientific staff. Seizing the opportunities of the genomics sector will generate ever-stronger growth. Building on learning from earlier industry partnership projects, Genomics England’s Discovery Forum marks an acceleration in our work to consolidate the UK as the global centre of genomic research, discovery and investment. Fundamentally, the Forum aims to catalyse the entire genomics ecosystem: from small and specialised start-ups all the way through to the big pharma companies. The goal is to align the right companies with the right opportunities. It is a virtuous circle: high levels of investment stimulate the growth of new and existing businesses − which attracts the world’s best research talent − who create the most innovative technologies − which attracts high levels of investment. We held our first Discovery Forum in November 2017 and the appetite from industry was clear − with more than 120 attendees representing more than 50 companies from the genomics domain. Importantly, and for the first time, investors joined the partnership. Exemplars of work between industry and Genomics England. Forum members were also able to ask ‘live’ questions during the event – using an interactive platform. Answers were either given in real time, or collected for later and more detailed responses. Evaluation is a core objective of every Forum – ensuring that we continually deliver to industry need. I’m delighted to say that feedback from this meeting suggests we hit the ground running. We will carry this forward to our next Forum in March, as well as other global partnership opportunities such as our presentation on leveraging the UK lead in genomics in San Francisco on 8 January 2018. Genomics is made up of many moving parts − from the understanding and consent of the public, to truly pioneering research, to building an effective NHS infrastructure. But make no mistake, the Discovery Forum and the industry partnerships it builds are every bit as important to the success of genomic medicine. As I said at the start of this blog, the time for talking about genomic potential is past. The time to talk to business − and forge partnership on an industrial scale – is now. “We welcome the Government’s Industrial Strategy. This will enable us to build on the UK’s global lead in population genomics, to drive NHS transformation, improve health outcomes and realise future economic benefits for the UK. I am delighted at Patrick Vallance’s appointment as the new Government Chief Scientific Adviser. Patrick is one of science and technology’s strongest and most passionate advocates – built on deep experience of academia and industry. Patrick understands what the sector can do for the UK and I know that he will make a real and positive contribution working at the heart of government. 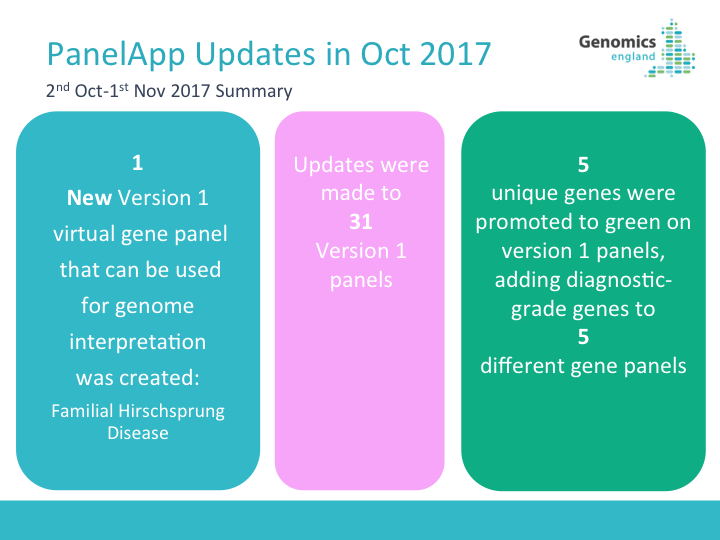 This includes updates to some HGNC-approved gene symbols. New webservice queries are available; you can specify assembly GET parameters with either GRch37 (default) or GRch38 as a value. Ensembl Ids will be returned for the specified assembly version: GRch37 version 82 or GRch38 version 90 if they exists in the database. Updated documentation will be available through PanelApp soon. Early experiments showed that how the samples are collected, stored and processed can affect the quality of the DNA, and therefore the success of whole genome sequencing, so a new objective emerged: to transform pathology services’ tissue handling practices in the NHS. How could we better preserve and process tissue samples to make sure DNA remained as intact as possible, giving the highest quality genome sequencing further down the “pipeline”? We know that fresh tissue produces excellent Whole Genome Sequencing results. But, some pathologists hesitate to use refrigeration for fresh tissue sampling in case it affects other diagnostic tests. However, as set out in this paper by our pathology experts, Professor Louise Jones and Dr Clare Craig, these same changes are seen in samples that are treated in the conventional way, i.e. placed unopened into formalin until they can be batched for sampling. Thought should be given into the quality of the conventional approach before critiquing the quality of any new approach. Pathologists have a challenge ahead to navigate how best to handle tissues to enable optimal results with respect to morphology, immunohistochemistry and molecular pathology. These videos have been accredited by the Royal College for Continuing Professional Development (CPD) credits; follow the links to request certificates. We are also working on a short animation to describe how formalin damages DNA in tissue samples – watch this space for updates. Click to download the full RCPath article. Visit our dedicated cancer pathology page. Frequently asked questions for Healthcare Professionals.